Hey friends! It’s time for the Monthly Ingredient Challenge, again! Yay! This month we are using spaghetti squash. Now, I’ve had spaghetti squash as spaghetti before, but of course I wanted to try something new. So I used it as the noodles for chow mein. This chow mein is great because it’s carb free. And it has lots of great flavor. I used sriracha and honey in the sauce for a little sweet and spicy. Yum! You can mix up the veggies and use whatever ones you want. I used some that I knew my kids would like; broccoli, carrots, onions, and bell peppers. Some others that I think would be great are; mushrooms, sprouts, zucchini, cabbage, etc. Cut the spaghetti squash in half long ways. Scrape the seeds and strings out of each half, then place the squash in the microwave. Have the cut sides up and microwave for 8-12 minutes. Until the insides are fork tender and you can easily scrape the insides into 'noodles.' Set aside. In a wok, or large skillet, cook the chicken in the olive oil until no longer pink, then add the carrots, diced onion and bell peppers. Saute for a minute or two, stirring frequently. Add the broccoli and turn heat down to medium low. Cover with a lid if you have one, and let the broccoli soften- about a minute or two. In a small bowl mix the soy sauce, honey, garlic, and Sriracha. Add the spaghetti squash noodles to the chicken and veggies and toss everything together with tongs. Drizzle the sauce over top and toss to coat evenly. Garnish with the sesame seeds and sliced green onions. Serve hot. 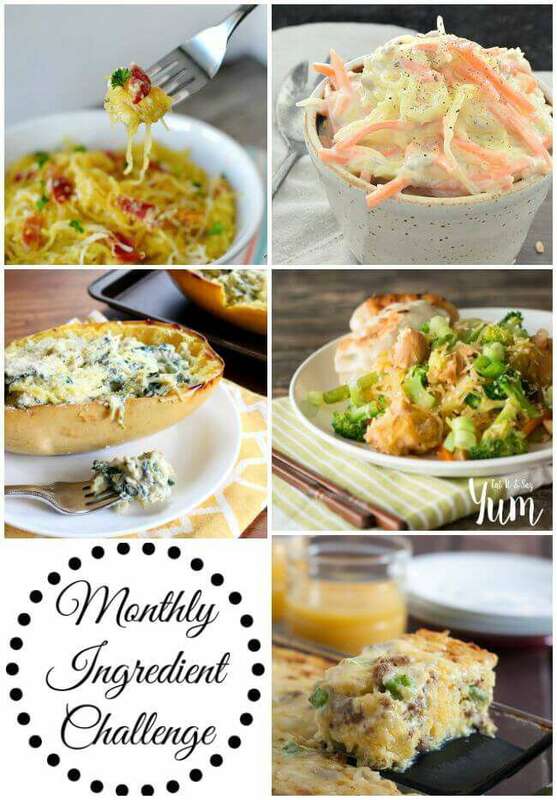 Don’t forget to check out all the other great spaghetti squash recipes from this month! I would have never thought to use spaghetti squash as an alternative to chow mein but this looks and sounds delicious! I’m going to have to try soon! Thanks Sydney! I tasted really good, I think the squash pairs great with the flavors of chow mein. 🙂 Enjoy!